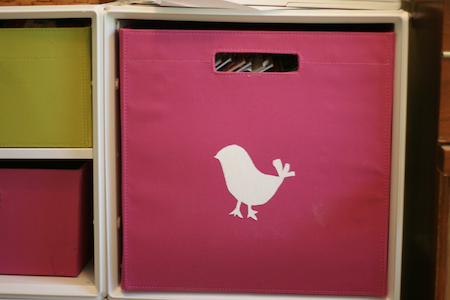 cardigans and kids: printing and organizing. sample bin for the library room. Since we have had our bench in the kitchen I have been wanting to get bins for each of the kids to make it easier to keep their things organized in the kitchen. We do not have a garage or a mud room, so our kitchen really is the catch all and can catch way more then I want it to. 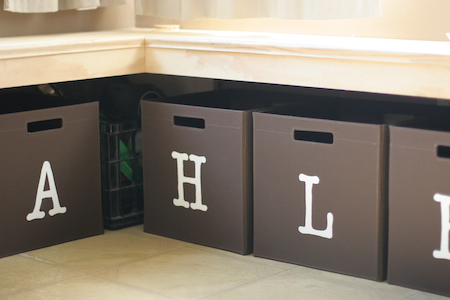 I purchased some bins at target to match the ones I already had and then have just been waiting for a day when I could freezer paper stencil the first letter of each of their names on them. The process took a bit longer then I thought it would, but I think that it was a good investment of time. Especially once the next school year gets under way and I need to stay a bit more organized then I am over summer break. After printing the letters. 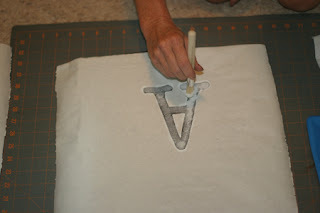 I tore a sheet of freezer paper for each letter. I tried to tear the paper about the size of one end of the bin so it would be a bit quicker to center. 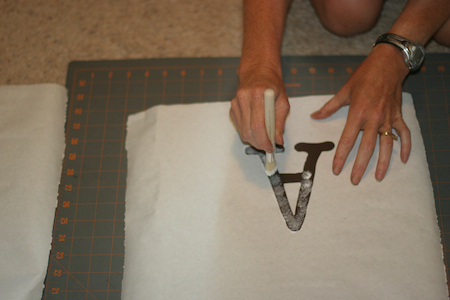 When taping down the paper with the letter on it. I measured to make sure that the bottom of the letter was close to 4 in. above the bottom so that they would all be the same. I used a couple of pieces of tape and just taped them down on two sides. 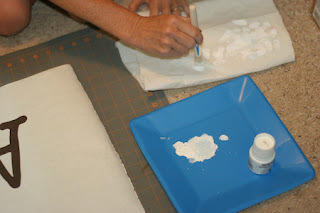 Then I begin cutting through both the printed out letter/paper and the freezer paper. I saved the cut-out letters for another project, because I am using the freezer paper that is missing the cut-out letter. After that was completed, I went ahead and carefully ironed the freezer paper (glossy side down) on the bin. I did not iron the entire sheet of freezer paper, just about 3-4 in. from the letters edge. Checking to make sure the freezer paper had adhered to the bin before printing onto the bins. Then I stippled the paint on. First I dabbed the brush in the paint that I had poured out into a paper plate. Blotted it a bit onto a paper towel to make sure the brushes paint was even. Then I stippled (up and down motion with the brush) the paint onto the bin. I set it up assembly line style and then after they all dried, went through and repeated to add more paint. 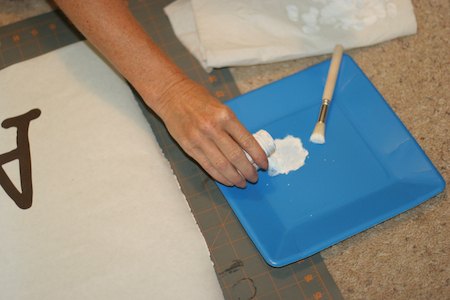 After the paint finished drying, I carefully removed the freezer paper from the bins. After finishing with the brush I washed them out. Threw away the used stencils. 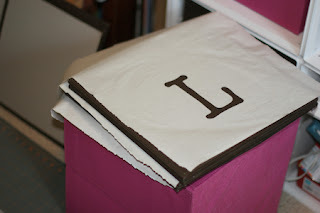 One resource I love is Lena Corwin's book, "Printing by Hand". It is a great resource book with a lot of projects and clear directions. 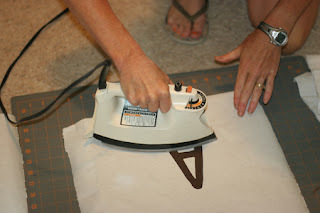 Another book that has some stencils and how-to's in it is Lotta Jansdotter's "Simple Sewing for Baby"